Kitchens are the hub of the home! This also means that they tend to collect lots of “stuff” and are difficult to keep clutter free. 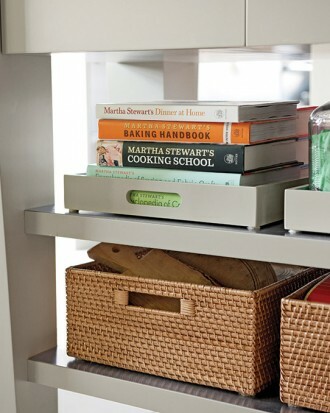 There are, of course, many organizational tools out there at places like The Container Store, but the ones featured here are low-cost solutions that can be applied to any size kitchen. I personally like to keep appliances, utensils, cookware, soaps, scrub brushes, dish towels, etc. out of sight. 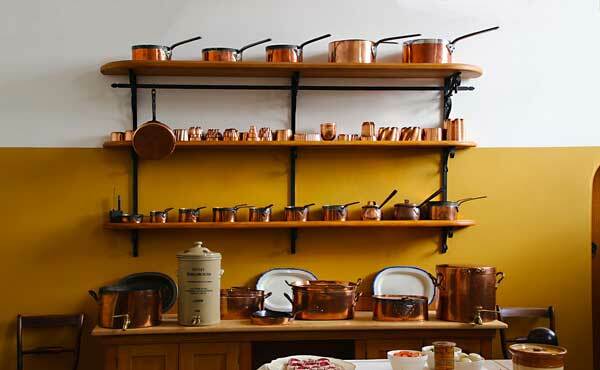 Sometimes it is a good idea to take inventory of what we really need in our kitchen, clean out, make a space for every necessity, and simplify life! Trust me, it feels good afterward! What exactly DamnTools wanted to explain is that, the hardest things for me to keep out of sight are those items we accumulate daily, like mail, keys, phones, papers, kid’s homework, and grocery items, so here are some simple solutions to keep your kitchen counter tops clutter free of these type items so that you aren’t embarrassed when visitors drop by, or most importantly, to keep your own sanity! Junk drawers are a necessity! 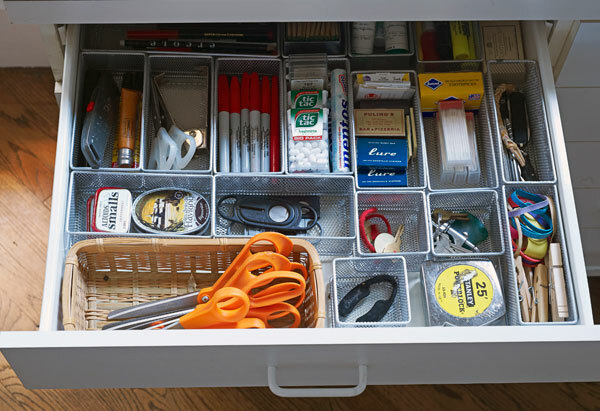 If you are an organizational freak, you can always purchase drawer organizers to help with the junk drawer. 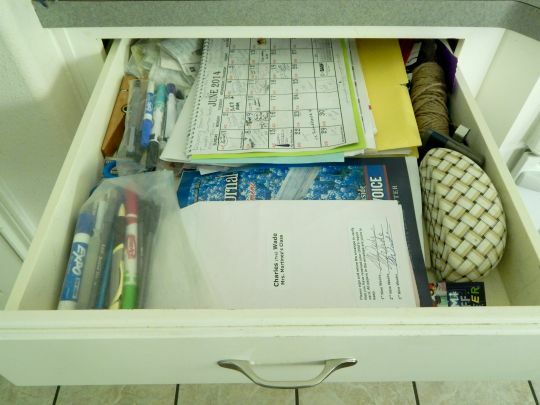 Amy VolkOr…if you are like me…you will have a “real” junk drawer…or 2! Believe it or not, I clean this drawer out every month or so, to make room for more junk! This is actually pretty clean. At least this stuff isn’t strewn all over the kitchen or house, right?Keep produce in baskets or bowls. I like these pretty hanging baskets! 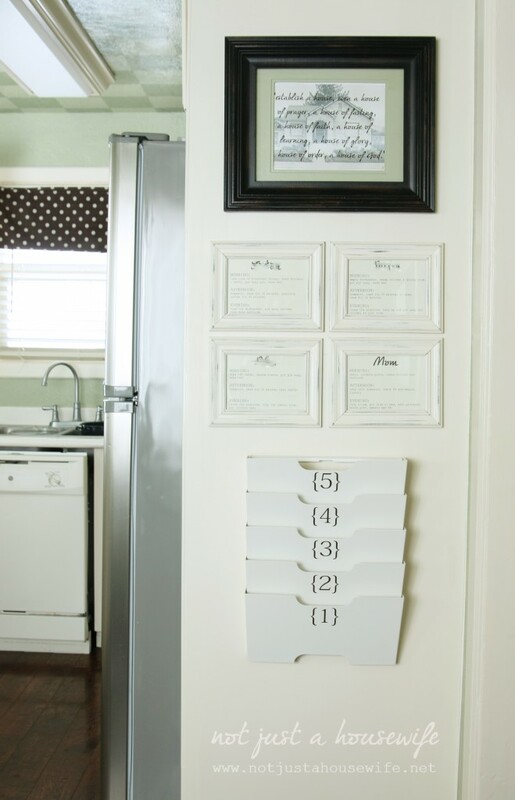 Create a place for mail, kid’s homework, papers, calendars, coupons, etc., etc. 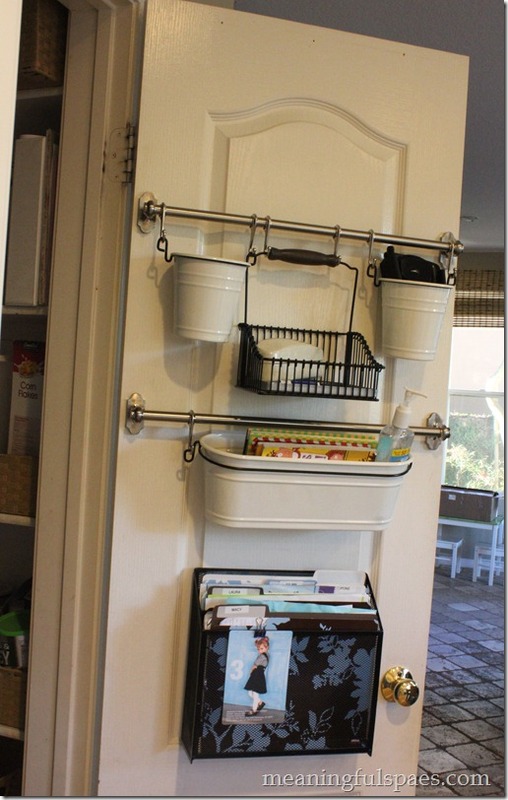 I love this solution on the back side of a pantry door from Meaningful Spaces. Make space for keys, purses, hats, jackets, and backpacks. I love these hooks for each family member! These hooks could be placed in a mud room, laundry room, hallway, or entry so that these items never end up on the kitchen counter or bar stools! 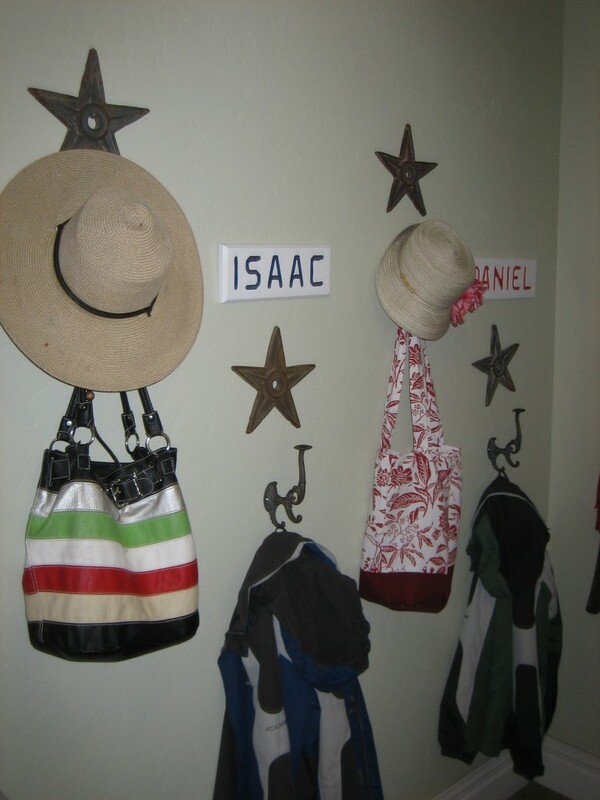 Hanging shoe organizers on the back side of a closet door is also a good idea for keeping small items out of sight. 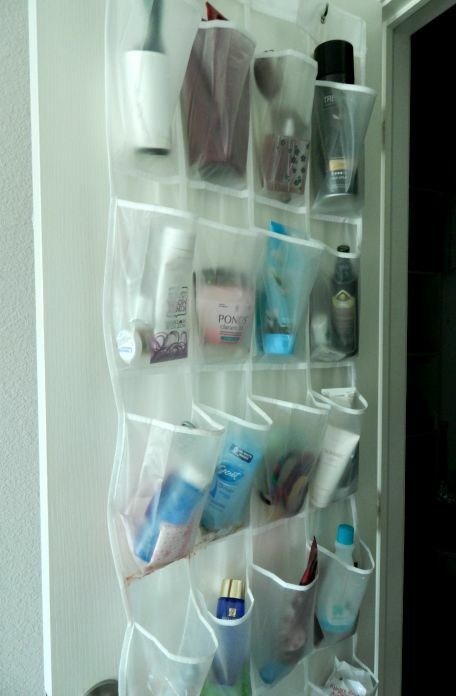 I do not have one of these in the kitchen, but I do have them on my closet doors in my bathroom and bedrooms. This would also work great on the backside of a kitchen pantry door! I highly recommend a “catch all” basket! 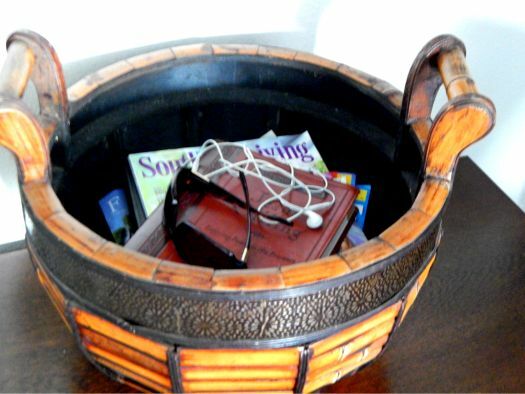 I keep a large basket in my kitchen to put books, magazines, papers, phones, sunglasses, or random items that my husband and kids have left lying around on the bar. Alright, alright, you caught me! I guess that Southern Living magazine belongs to me. And the sunglasses. Don’t these baskets look nice? You could have several “catch all” baskets if you have a place for them! Do you have any easy solutions for kitchen countertop clutter?